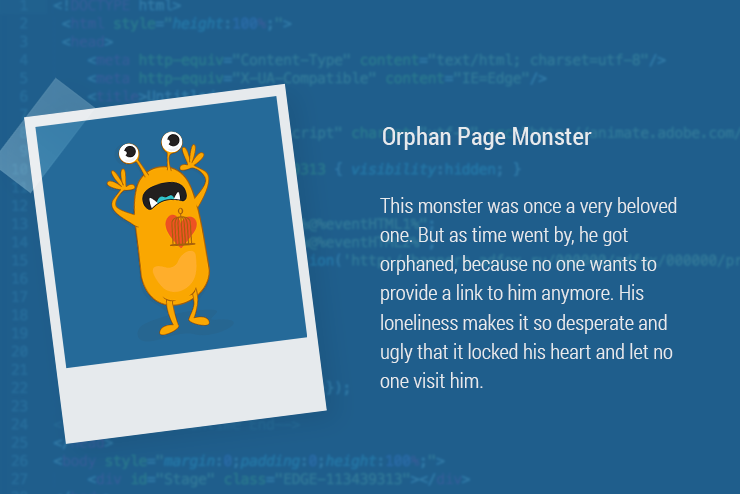 The orphan page monster is an embittered soul that has lost connection to the other sites in your domain. Because of a missing reference, it is simply no longer recognized. The danger lies in exactly this, because the Googlebot can, in general, not find abandoned websites and thus cannot index important content. In this article, we will show you how you can expose and fight this in a few steps. In search engine optimization, a site is designated as abandoned if it contains no internal incoming links and thus cannot be crawled by the search engine bots. This arises, in particular, when old content is changed and when, because of these changes, sites disappear from the group of websites. The principle of crawling by a search engine is based on hyperlinks that are followed by the search engine. Abandoned links can lead to the crawling of your website by the Googlebot being interrupted. If a website doesn’t contain internal or external incoming links, the site is not located within the structure tree of an HTML construct and is thus isolated from other sites. In this place, the bot has to stop and continue to crawl the website in another place. 1. The most frequent case in which orphan pages can arise is with an error in the web design. If it is with the relaunch of a site or in the creation of new contents, only a missing or incorrect link to a site can make this unachievable for search engines. 2. Orphan pages are often used as so-called doorway pages, because they have clearly incoming links, but can prepare overall outgoing links without backlinks. In this case, they serve as entry sites for further sites or contents. But even here, the search bot cannot find these contents because they have to be avoided from an SEO perspective. Figure 1: Still an affiliate site, or already a doorway page? In 2015, Google emphasized in an official announcement in the Google Webmaster Central that doorway pages that are created exclusively for search engines can influence the quality of the search experience. Thus, quality guidelines for this type of site are once again intensified. 3. Maybe you are asking why users cannot simply enter the URL of the orphan page directly into the address bar of their web browser. Naturally, they must also know about the address. For this reason, abandoned sites are often conceived as test sites in order to test certain contents or designs without making the crawler aware of these sites. Finding abandoned sites can be very complex. For this, webmasters should create a list with all the URLs of their website and compare these with URLs that are actually crawled. With Ryte, you nevertheless have the opportunity to detect orphan pages on your website within a short amount of time. The single view shows every individual abandoned page. Finally, you should join each of these sites with the internal links in your site structure and link them sensibly and according to topic. Tip: In the removal of 404 error sites, as well as the removal of orphan pages, you should update your XML sitemap. By checking the Google index, you can ensure that the indexing of your website is optimized and that only functioning contents make it into the Google index. Abandoned sites can influence the search engine robot’s ability to record all sites, because it will always be running into the URLs and canceling its search. Do not allow this to happen, and identify sites infected with the monster before you cause damage. Published on 06/21/2017 by Eva Wagner.